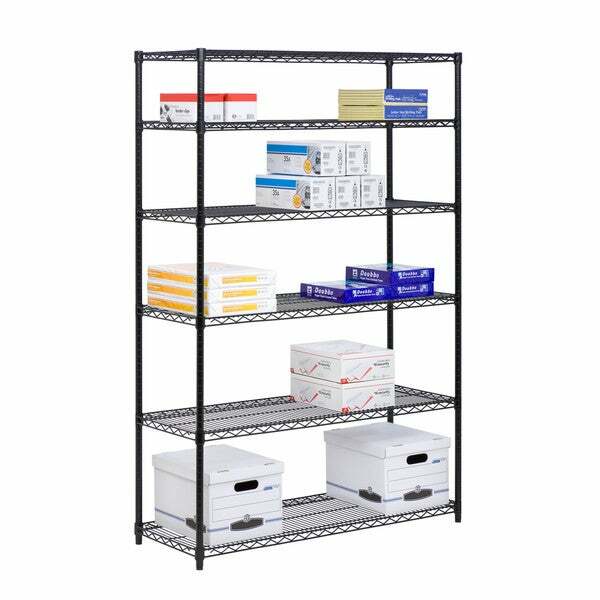 Honey-Can-Do SHF-01911 NSF 6-Tier Adjustable Storage Shelving Unit, Black. Create visible, accessible storage space instantly with Honey-Can-Do industrial shelving systems. Contemporary black finish and sturdy steel frame make this unit the perfect blend of style and functionality. Durable enough for the home, garage, or commercial kitchen; this NSF-rated shelving for food equipment areas including refrigerators, freezers, and warewashing areas is capable of withstanding an amazing 600lbs per shelf without casters. Adjustable shelves allow you to change the configuration as your storage needs evolve. Combine multiple units to create a customized storage wall. The no-tool assembly allows you to construct in minutes a shelving unit that will last for years. "What are the dimensions of this item? " This shelving unit measures approximately 72 inches high x 48 inches wide x 18 inches deep.